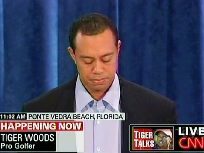 Tiger Woods Speaks Out - "Elin Not To Blame"
Tiger Woods is current giving his live press conference. You can watch it live at Citizen Tube. Tiger Woods just cleared up the rumors about Elin physically abusing Tiger on Thanksgiving day. Tiger Woods just said that Elin has never hit him, and there has never been any physical abuse in their relationship.